In my rods I try to gather all the experience and knowledge that generations of rod builders have found in their search for the optimal performance, both in materials and designs. During my 26 years as a rodmaker, I have reached the insight that a splitcane rod is so much more than just a nice piece of fishing equipment - It represents our fly fishing heritage, devotion to craftmanship, and the beauty of design. These values are shared by many splitcane rodmakers around the world and contributes to, that the passion for split bamboo will be carried on to future generations. The fact that you can build a onehanded splitcane rod up to a length of 8'6" and two handed rods up to about 13', that handles the fish better then any rod made out of artificial materials, will indeed show that bamboo are an excellent rodbuilding material. 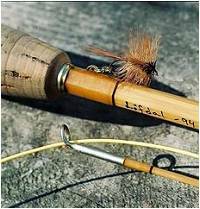 That a splitcane rod in addition also are the most beautiful piece of fishing equipment that man can own, comes as a pleasant bonus.